A 22-year-old man has appeared in court charged with causing the death of a chef in Edinburgh. 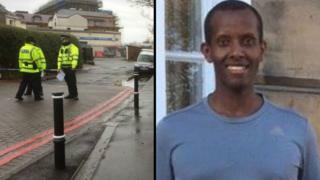 Lionel Simenya, 36, was struck by a car on Ford's Road in the Saughton area of the city at about 03:50 on 7 March. Declan Mayes is charged with causing death by culpable and reckless driving. He made no plea at at Edinburgh Sheriff Court and was remanded in custody. Mr Simenya was originally from Burundi but had lived in the UK for several years.